If you guys were wondering why I never posted a book review for the last book I read (the second book in the Ruby Oliver series, the boy Book). It’s because I started my own Youtube channel and it is the first video I posted! I also talk about Scott Weiland and a few other things. So, check it out! The quality is pretty bad since it is my first video and I was nervous. But if I can drum up some support I can afford a better camera and some nice software. If anyone has some suggestions on a good free software, please let me know! Sorry about the giant picture, folks! I took these pictures on my cell phone and I’m still getting used to using pictures on WordPress. Before I get to today’s Lush post, I want to talk about an upcoming project I’m working on. Now, my ultimate goals from all of this is not to become famous or anything. Really, I just want to talk about things I enjoy and hopefully get the attention of some publishers to give me some advanced readers copies. I think I may have mentioned to you guys before that I do have a video camera, but the charger is M.I.A. and it is dead. So, my first video that will go up on Youtube will be done on my laptop webcam. However, imagine my luck with I came across the newer version of the video camera I have on sale for $10! I have already placed my order for it. I won’t be without a camera for very long! For those of you that want to know, my first video will be a review on the book I am currently reading, which is the second book in the Ruby Oliver series. However, my Youtube channel will not just cover books but will cover anything I feel like discussing. I will still be posting everything (including videos) here on WordPress as well. Now that I got all that covered, let’s get to the Lush stuff! I don’t actually have a picture of Herbalism to post up here because I only bought a small sample from Lush. Which was probably a good thing because I am still fighting a breakout that I got from this stuff! Needless to say, I am not repurchasing. But for those of you that might be interested, this is the main acne fighting cleanser from Lush and it is another “cleanser roll” that works like Angels on Bare Skin (see my previous Lush post). For pricing information check out Lush’s website. This exfoliating cleanser is made with sea salt, organic lime juice, and avocado butter. It was suggested to me by a clerk that said it would help with my breakouts and brighten my skin. However, the sea salt in this stuff was way too harsh for my skin for every day use and I wanted something I could use every day. Imperials is the first facial moisturizer that I bought from Lush because on the website it says that if you are not sure about what kind of moisturizer you need, this one was a good one to start with. Imperials is made with lavender and orange blossoms and it smells absolutely wonderful! However, it is a bit too thick for my oily skin and once I use it up I plan to move on. I would recommend this moisturizer for anyone with normal to dry skin. This is actually one of the cheaper moisturizers at Lush. But a lot of the other ones run at over $40! This book was more than just a breath of fresh air. I feel as if it has been a long time since I last gave a book the full 5 star rating. The funny thing about that is that this book is a Young Adult Chick Lit story. Proving once again that even the most harshly criticized genres of novels can produce a story with heart. Many thanks to the friend I bought this book from on Ebay! The doctor encourages Ruby to create the “boyfriend list.” This list contains any boys that she may have had any feelings for or had any encounter with that may be deemed important. From there, we find out how each of these boys influenced the events that unfolded and/or how they influenced Ruby as a person. I cannot praise this series enough! It has been such a long time since I was this emotionally invested with a book or its characters. You know the feeling I’m talking about. When you are just so sad after reading that last page. You want more. You need more. Not only that but I just feel so connected with these characters. I love and felt for Ruby during her journey. Yes, she made a lot of mistakes. But she also learned from them and grew by the end. She learns to be assertive and to stand up for herself in relationships and that boys and popularity do not make the world go round. I kind of despise Jackson and Kim, even though they are just teenagers. I like and believe that Megan is misunderstood. I know Ruby doesn’t end up with anyone in the end (which is refreshing), but if she gets paired up by the end of the series I am on Team Gideon! Noel would be my second choice. 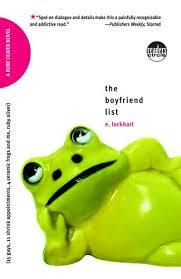 Thank you E. Lockhart for writing a beautiful, thought provoking, and realistic teenage novel. I gave this book 5 stars on Goodreads.